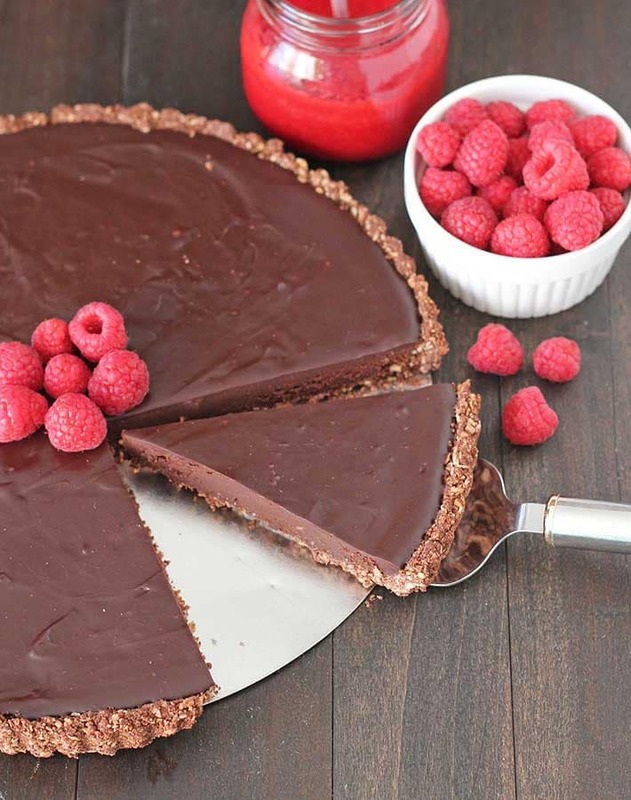 A rich, vegan chocolate tart recipe that will impress your family and friends. This delicious, show stopping, gluten-free dessert will fix any chocolate cravings you may have! This looks like a fancy dessert and may even look a little intimidating to make, but none of that is true because it’s actually VERY easy to make. You’ll see, as I walk you through, step-by-step. Keep reading! This is a recipe that I’ve been making for a very long time, but I haven’t always made it this way. The original recipe was one I found in a magazine and it was definitely not vegan or gluten-free…the original recipe contained eggs, cream, and butter. 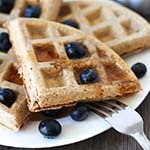 Back then, I made the recipe as it was written because I still ate those things, but a few years ago, I gave it my own vegan and gluten-free spin and I have to say that I like the vegan gluten-free version much better than the original! I’ve had mine for close to 15 years now (I originally bought it especially to make this recipe!) and it has held up after all that time. Over the years, I’ve made MANY different types of sweet tarts in it and I’m glad I have it in my collection. You can click here to see it on Amazon. Can a 9″ Tart Pan Be Used Instead? How About an 11″? This tart pan comes in many sizes. I made mine in a 10″ pan because that’s what I have, so I created this recipe around that size. If you have a 9″ pan, you can still make this recipe, your tart will just be a little thicker. Baking time for the crust will remain the same. If all you have is an 11″ tart pan, the recipe will still work, but you will experience the opposite: your tart will be thinner and you will have to decrease the crust baking time by a few minutes. I would not recommend an 11″ pan. For best results, stick with the 10″ pan, but if you need to use a different size pan, be aware of the info above. 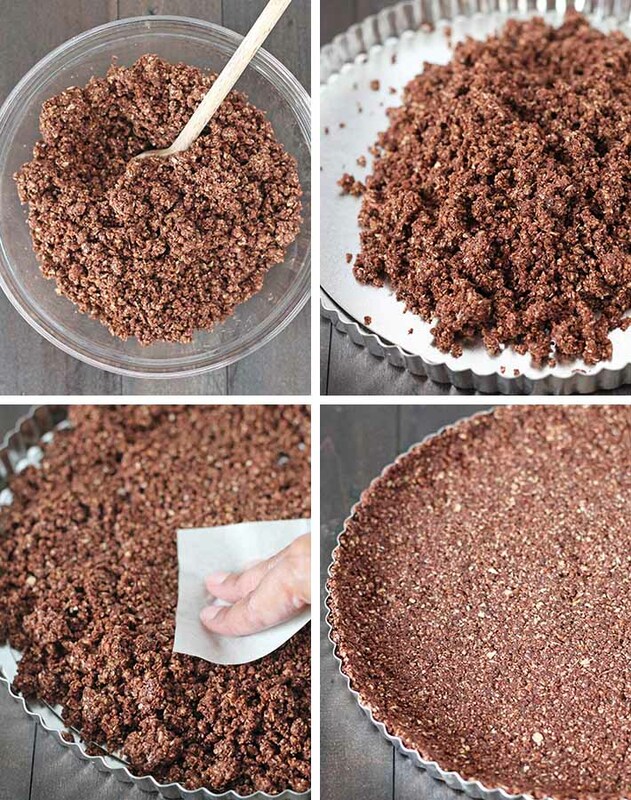 So now that you know the proper pan you’ll need to make this vegan gluten-free tart, let’s talk about the steps you’ll need to follow to make the crust, the first step in making your vegan chocolate tart. 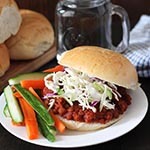 The full recipe and detailed directions can be found at the bottom of this post, but I recommend reading the steps and looking at the pictures before making. The original recipe had a flour-based crust but I changed that up by using an adaptation of the crust I use in my vegan sweet potato pie and vegan chocolate pumpkin pie. The crust is almond and oat based and it adds a nice contrast to the soft, chocolaty truffle filling. First, you need to combine all the ingredients in a food processor, process and then transfer to a bowl to give it all a final mix. You’ll then press the mixture into the tart pan and bake. 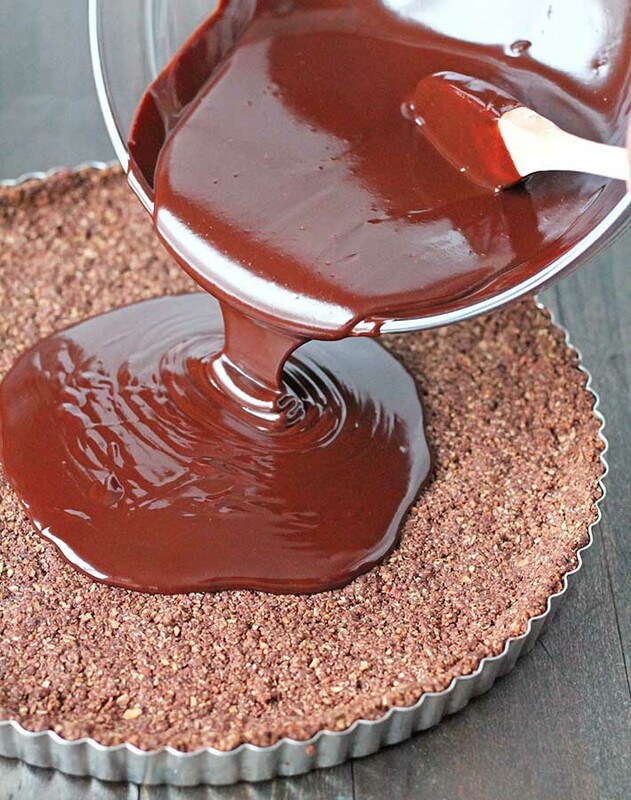 After the chocolate tart crust has baked, it will need to fully cool before adding the filling. Once the crust has cooled, you’ll make the vegan chocolate ganache filling by warming up (not boiling) the coconut milk and then pouring it over the chocolate chips. Let it sit for a minute and then stir until the chocolate chips have melted and the mixture is smooth and velvety. Most high quality dark chocolate chips are vegan, but always check the ingredients to be sure. To figure out if a particular brand is vegan, read the ingredient list and look for dairy ingredients. Here in Canada, President’s Choice decadent semi-sweet chocolate chips are vegan and very easy to find (it’s what I used in this recipe), and there’s also Enjoy Life, or Kirkland Signature at Costco. In the US, you can use Enjoy Life, Kirkland Signature from Costco, or check Whole Foods, or Trader Joe’s. If using vegan chocolate is not necessary for you, any good quality dark chocolate chips will do. 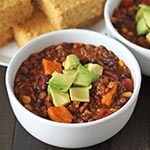 Before making this recipe, be sure to take into account the time it will take to chill. This is a dessert you’ll want to make well ahead of serving time. 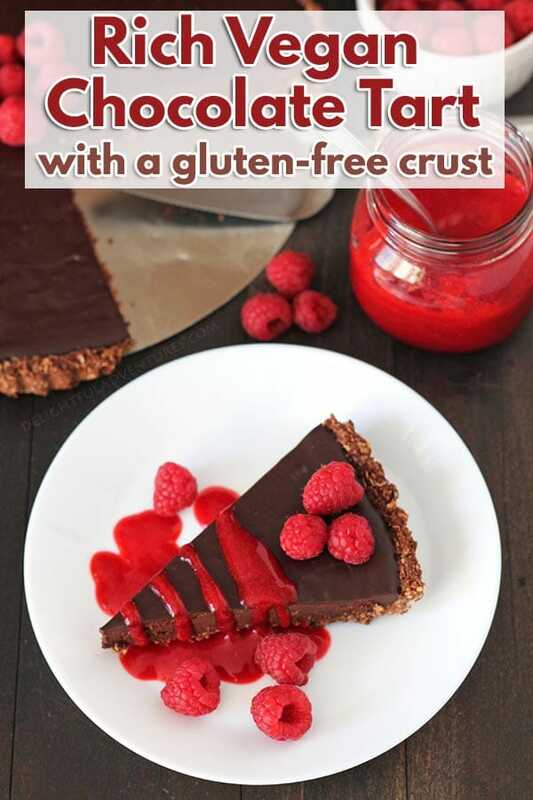 Once your gluten free chocolate ganache tart has chilled, it’s time to slice and serve! My favourite way to garnish this tart is with raspberry sauce and fresh raspberries. 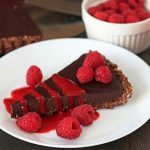 Raspberries and chocolate go very well together, especially when the chocolate is dark chocolate, like in this dessert. I make my easy raspberry sauce to drizzle on top of the tart and if they’re available, I buy a small container of fresh raspberries to also garnish the tart and plates, like in the pictures. 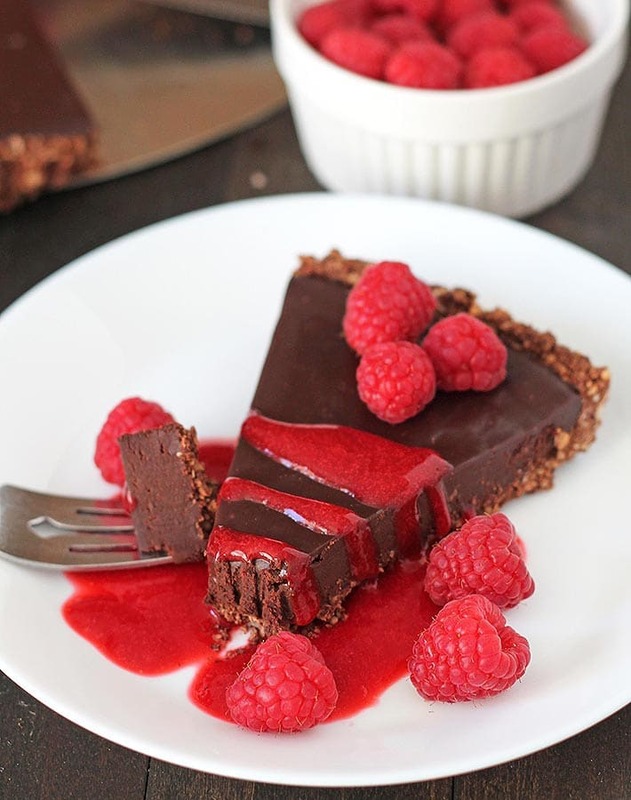 This transforms your dessert into a rich, chocolate raspberry tart, filled with even more flavour. If you don’t like raspberries and the idea of a chocolate raspberry tart, you can also top with just coconut whipped cream (you can never go wrong with coconut whipped cream!) and a little dusting of ground cinnamon. You can slice and serve the tart cold, right from the fridge, or you can slice while still cold, let the slices sit for a while, and serve at room temperature, which will make the dessert a little softer. It all depends on your preference. Just be sure to slice while it’s still cold, the filling will begin to stick to the knife, when slicing, as it softens. …tell me about it! Share a pic with me on Instagram, or leave me a comment below. And don’t forget to pin it to Pinterest! 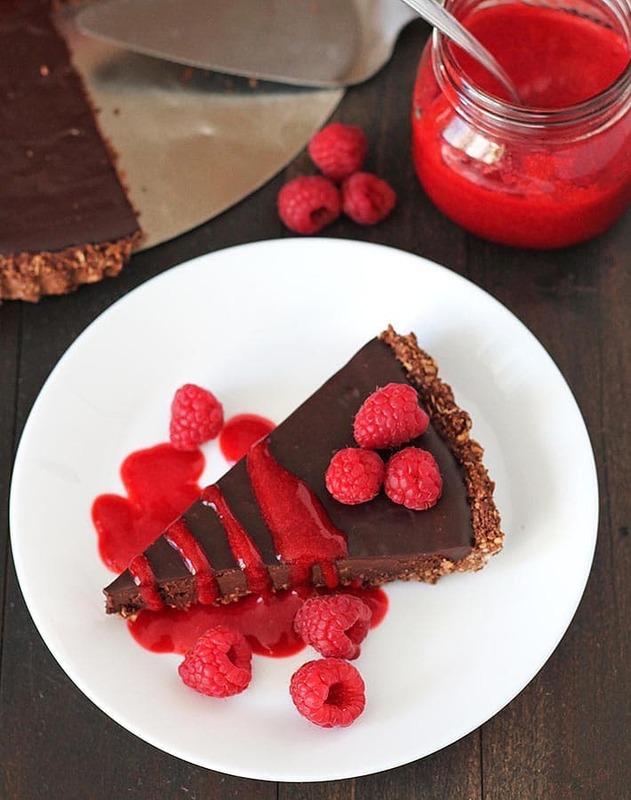 A rich, vegan chocolate tart recipe that will impress family and friends. This delicious gluten-free dessert will fix any chocolate cravings you may have! Add rolled oats, raw almonds, coconut sugar, unsweetened cocoa powder, and ground cinnamon to a food processor or to the dry container of your high speed blender. Blend until ingredients have been broken down into a course meal. Some small pieces of almonds may still remain, that is okay. Slowly add melted coconut oil and pulse until everything has been combined. Transfer mixture a bowl and mix to ensure the coconut oil has been distributed throughout the mixture. Refrigerate the crust for 15 minutes. After the 15 minutes have passed, remove from the fridge, place in the oven and bake for 20 minutes. Remove from oven, set aside to fully cool. Add the chocolate chips to a heatproof bowl. Set aside. Add the coconut milk and cinnamon to a small pot and whisk together. Heat over medium-low heat until it's hot to the touch and steam is coming off the mixture. 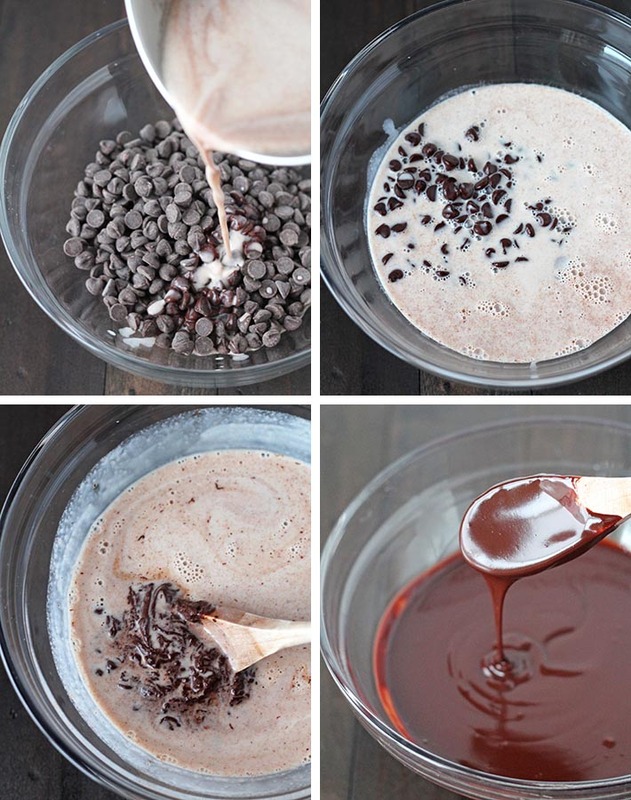 Pour the coconut milk over the chocolate chips and let it sit for 1-minute. Once the minute has passed, add the vanilla and stir until the chocolate has fully melted and mixture has fully combined (see images above). Pour mixture into the cooled tart crust and chill until set, about 2 hours. Be sure to also read the Q&A above to ensure your tart turns out perfectly. Full fat coconut milk must be used for this recipe, don't use light. Use high quality chocolate chips for this recipe for the best results, see above for more info. If you are unable to get good quality chocolate chips, you can use 12oz / 280g of finely chopped bittersweet chocolate to replace the 3 cups of chocolate chips. Either virgin or refined coconut oil can be used in the crust, but note that if you use virgin coconut oil, there will be a slight coconut flavour. Cover and store uneaten tart in the fridge. When you are ready to serve again, serve cold or let it come to room temperature and serve. Calorie count is for 1 of 12 slices and is only to be used as a rough guide. Click here to learn how nutritional info is calculated on this website. I just made this for my family for Mother’s Day, but I swapped the vanilla and cinnamon in the filling for some orange zest. Only my sister is vegan but everybody absolutely loved it! Such a simple recipe, but it works so well, thank you for sharing! Hi this looks divine but unfortunately here in the Netherlands it is almost impossible to get vegan chocolate chips. We can get vegan chocolate but I’m stymied by the ‘cups of chips’. Could you please elaborate on that? I don’t think it is a problem to use regular chocolate, do you. Chocolate chips here are an awful quality! Hi Melané, you can use regular chocolate if you don’t have access to good quality chocolate chips. You will need approximately 12oz / 280g of finely chopped bittersweet chocolate to replace the 3 cups of chocolate chips. Let me know how it goes!